KeePass Tusk is a free keePass Firefox addon to access passwords without KeePass application. You can now easily use the passwords stored in KeePass database without KeePass software. This addon uses the KDBX password database created by KeePass 2.x to import all the passwords and usernames. To import password database, you will have to keep the database file in any cloud storage service that it supports. It can fetch the database from Google Drive, Dropbox, OneDrive, WebDav, etc. This KeePass client supports password search and autofill. And it automatically pulls the stored password based on the currently opened website. If you want to use all your KeePass passwords in browser without using the KeePass desktop application then this addon will help you. And not only Firefox but it can be used in the same way in Google Chrome as well. The interface is very simple and you can copy passwords to clipboard or use autofill to fill them automatically in password fields. 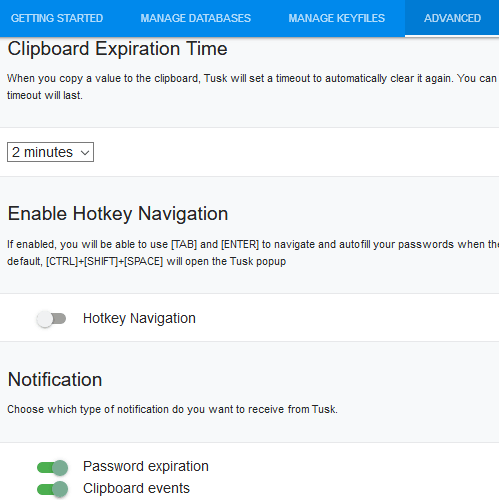 This addon focuses on security and that’s why it removes passwords stored on clipboard after 2 minutes by default. Also, after accessing passwords, it locks database again. Whenever you need to use it for the second time, you will have to specify the master password again. You can simply install this addon from here. After that, you will have to configure the cloud storage. 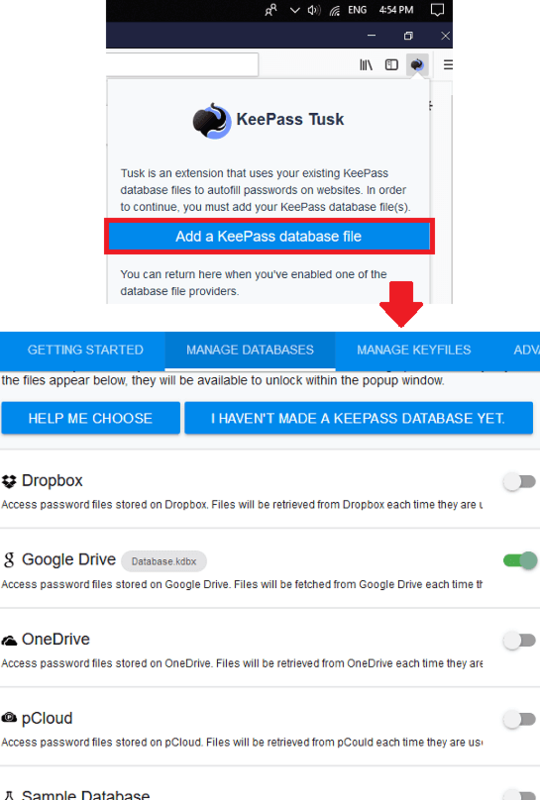 If you already have stored the KeePass database file to Google Drive or any other location then start connecting your account. Simply click on the icon of the addon and then proceed with configuring the cloud storage. You can enable the any cloud storage from the list and then login and verify. It will automatically fetch the password database file by searching it. Now, you can start using the addon to enter passwords. Open any website and then click on the icon of the addon. Select the database file that it fetched. If there are any password stored for the current website then it will show that. But before that, you will have to unlock the database with your master password. To enter a password, you can either use the autofill method, or copy them to clipboard. For more details, you can see the GIF that I have added above. There are some things which can be customized. For example, if you want to change the password database file then you can change that. Also, you can change the settings for cleaning the clipboard after specified time. This way, you can use this KeePass Firefox addon to quickly access your password without using KeePass desktop application. And it prevents unauthorized use of the database as it automatically locks it after you use it. Also, you can only make it remembers master password of the database for the current session only. 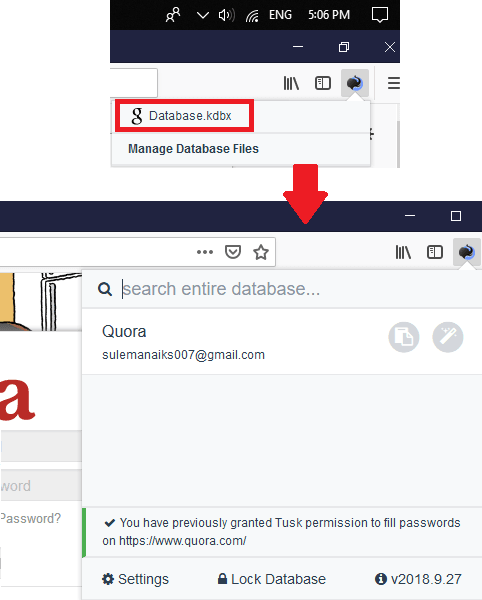 KeePass Tusk is a really powerful addon for Firefox and Chrome that you can use. This is a good option if you want to have all your keePass passwords but don’t want to use the desktop application. You just need to put the KeePass database file anywhere in any cloud storage service that it supports and import that easily.